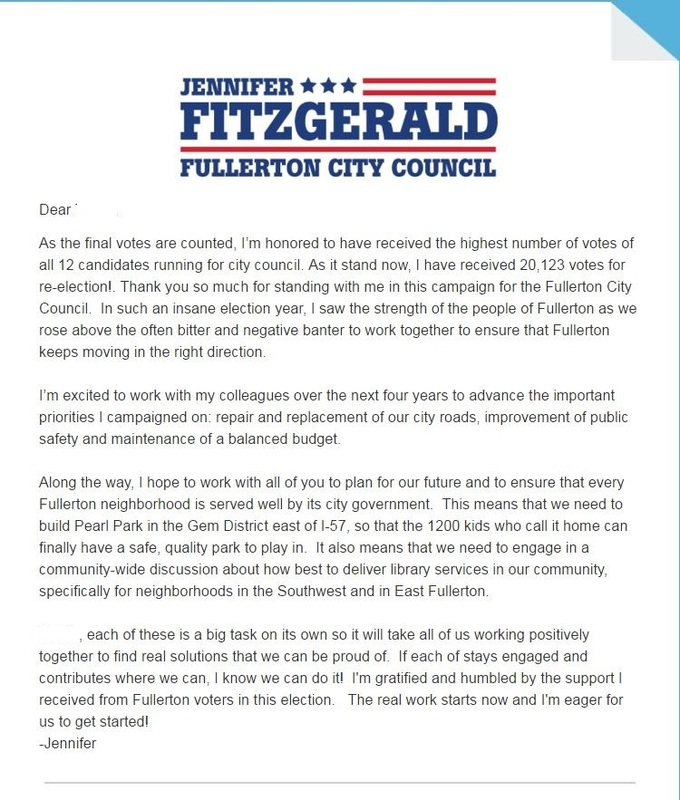 I got a letter from Fullerton’s Lobbyist-Mayor, Jennifer Fitzgerald congratulating “us” for rising above it by re-electing her. I love it when personal-agenda laden politicians complain about “negativity.” Generally they are just reacting to embarrassing scrutiny they’d rather not have to endure. Ms. Fitzgerald is happy to share the issues she “campaigned on.” Road repair, more, and higher paid cops, and get this… a balanced budget! Now we all know that Fullerton’s budget has not been balanced since she got on the City Council four years ago. We’ve been leaking red ink worse than Laguna Lake has been leaking Grade A MWD water. The amount during Fitzgerald’s tenure runs in the millions. So not only is she still lying about having a balanced budget, but any other pipe dreams like cops and parks are going to have to come at the cost of draining our reserve funds even more.